Looking for a way to add a bit of traditional elegance to your bathroom design? When you want to upgrade the look and feel of your bathroom, consider installing a faucet or other fixtures and accessories from Moen's Muirfield suite in your home's bathroom. 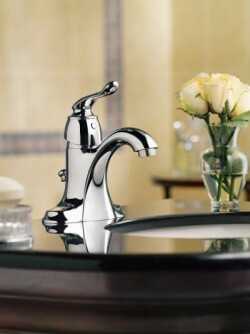 The classic faucet pictured here has modern water-saving features designed with conservation and utility cost control in mind, paired with a simple to operate and beautiful high arc spout. “The Muirfield bathroom suite offers a traditional style with exceptional design consumers prefer in a quality product backed by the Moen name,” said Kevin Campbell, Moen’s director of retail marketing. You can choose from several different faucet styles, selecting between single and two handle options with either standard, mid, or high arc spouts. You cal also select the finish that best coordinates with your overall bathroom design, choosing among Chrome, LifeShine® Classic Brushed Nickel and Old World Bronze. Every person that has a small bathroom is interested in ways of making their bathroom appear larger. Remodeling the bathroom is not always an option and in many cases, remodeling the bathroom would be very expensive. There are a number of ways that a person can use to make their small bathroom seem larger without having to undertake any heavy construction. One of the easiest ways that a person can alter their small bathroom design to make it appear larger is to choose light soft colors for the d�cor of the bathroom. Bright, bold colors can be used in small bathrooms, assuming you reserve them for accents only. Going overboard with bold or dark colorstend to make the bathroom appear tighter and more intimate. If your bathroom has wallpaper, avoid using large prints or busy pattern. Instead, choose very subtle wallpaper patterns. Better yet, keep one wall free from any pattern at all. Consider making the largest wall in the small bathroom into a mural of an open space. Just like light colors on the walls, light colors on the flooring of the small bathroom will help make the bathroom appear roomier and more open. The most popular colors for a light bathroom floor are tans, light grays, and light blues. By incorporating these colors into the flooring of your small bathroom design, you will have the basis for a light colored decorating scheme that will make your bathroom appear more open. Another small bathroom design that can be used to make a bathroom appear larger is to replace a large vanity or countertop with a slimmer, pedestal sink. 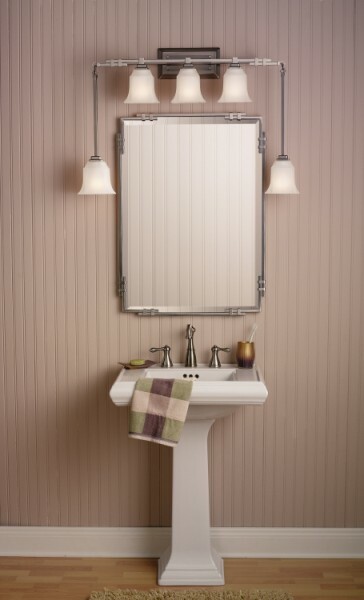 A pedestal sink can be found in many different styles, colors, and materials, allowing them to be matched to any d�cor. By placing a pedestal sink in the small bathroom, you can open up the bathroom space by another ten percent. When selecting fixtures for your bathroom, keep in mind they are going into a small space. Choose simple designs made from smooth surfaces, such as ceramic and marble, and opt for light, neutral tones. Additional lighting in a small bathroom can make a world of difference in the way the space in the bathroom is perceived. Consider adding additional light fixtures or using higher wattage bulbs, as appropriate. By making the bathroom brighter and more inviting, it seems that the space has opened up and the walls are farther apart. There are a variety of ways that additional lighting can be added to the small bathroom without taking up more space than is already used, including installing a new window, or even putting in a skylight. Many people choose to open up the amount of space available in their small bathroom by greatly reducing the amount of items that they place into the bathroom. Items such as storage shelves, hampers, and decorative items all take up valuable space in a small bathroom and the bathroom will appear much larger if these items are removed and the things that they hold are stored somewhere else. Some people choose to place a small storage cabinet in their hallway near the bathroom as a place to put all of the things that they would normally keep in their bathrooms. It's also a good idea to consider putting laundry hampers in the bedrooms instead of in the bathroom. Extra supplies and paper products can even be stored in the pantry. 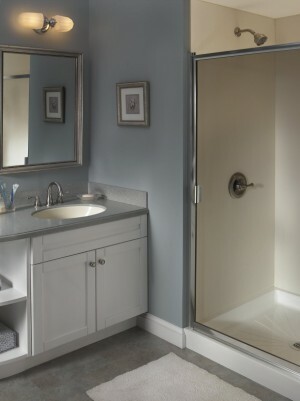 Adding additional mirrors to the bathroom will also help the bathroom appear bigger than it really is. Placing additional mirrors in the bathroom will help to capture all of the available light and reflect it back into the room to make it brighter. Adding extra mirrors to the room will also add depth to the room, as the mirrors reflect each other and make the walls appear farther away. Other ways you can use to make a small bathroom design appear larger include removing clutter and extra items. Instead of storing all of your beauty items on the counter, place them in a cabinet or in the medicine chest when not in use. The more items are visible in a small bathroom, the more cramped the space will look and feel. Using these subtle design changes to modify the look of your small bathroom is easy, inexpensive, and most of these design changes can be completed in a few hours. By changing your small bathroom design, you can make your small bathroom appear larger within the space of a day. Need help with your Kitchen? Find & Buy Kitchen Cabinets cheaply.